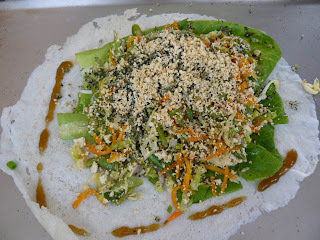 While most of the Lumpias consisted of the standard sauteed vegetables and shrimp (or pork) rolled in a fresh or fried wrapper, the Chinese-style Lumpia had all that, plus some interesting toppings of seaweed flakes, a ground peanut-sugar crumble, and crisp vermicelli noodles. 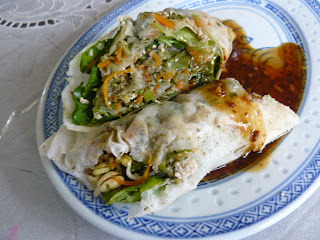 According to the Vendor, she prepares the vegetable filling by sauteeing diced shrimp and pork belly in plenty of shallots and garlic. She then adds sliced green beans, cabbage, carrots, firm tofu, and seasons it with salt and pepper. 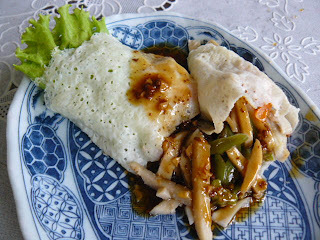 She makes a brown sauce by boiling water, brown sugar, soy sauce and minced garlic, thickened with a cornstarch slurry. I watch her assemble the Lumpia as she lays a romaine lettuce leaf on the fresh wrapper (see top photo), then proceeds to layer the drained vegetable filling, topped with the crisp vermicelli noodles, seaweed flakes, ground peanut-sugar crumble, fresh cilantro leaves and some minced boiled egg. 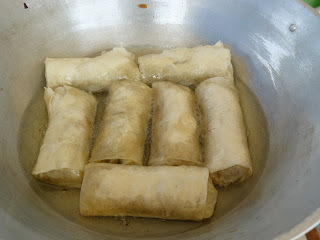 Brown sauce is drizzled on and the lumpia is done. It's a wrap! 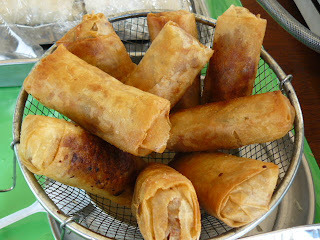 Wow - you look like you had a whole feast of lumpias while you were in the Philippines - my favourite of what you had is definitely the popiah... I miss that! come over and visit, trissa, and i'll take you to my favorite hole-in-the-wall popiah place! 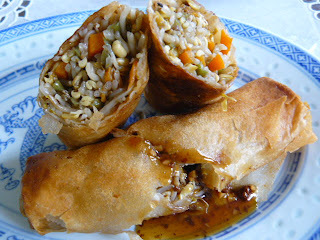 Yummy, love that Chinese style lumpia as well as the others! You did go nuts. They all looked wonderful. 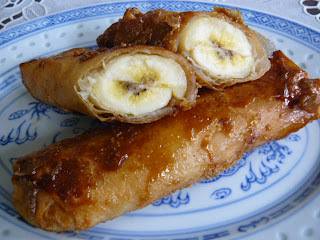 Turon... how I miss turon...it's a nice finish after eating the lumpiang togue with lots of sawsawang suka... yum! D, Joy and Malou, yes, I did go nuts! And they were all delicious. Ay naku! I'm so jealous, I have to close my eyes with my hands but still peeking between my spread out fingers...I love them all!